UFC 83 SERRA VS ST PIERRE 2 had winner St Pierre over Matt Serra by TKO in the second round. April 19 at the Bell Centre in Montreal Georges St Pierre (16-2) regained his mixed martial arts Ultimate Fighting Championship crown from Serra (16-5) during the first UFC show in Canada. In front of his hometown crowd, St Pierre showed his determination. The pace was fast during the first round. There was a takedown by St Pierre within five seconds. He definitely didn’t want a repeat from a year ago. Serra wanted to force a standup and keep his distance. St Pierre used his punches to keep Serra down in the Octagon. UFC 83 SERRA VS. ST-PIERRE 2 Matt Serra vs Georges St. Pierre weigh in results. A usual Ultimate Fighting Championship has only a couple of thousand people. 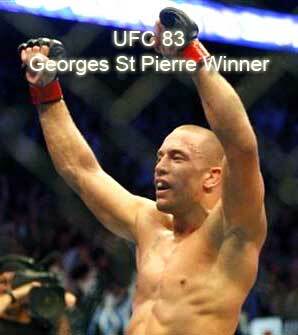 In Montreal, Canada, about 7,500 excited mixed martial arts fans cheered for their man from Quebec, St. Pierre. The king of UFC 83 17-pound weight class will be determined tonight in Canada.